I am so excited about this upcoming year and I have a feeling that it is going to be the best one yet! I've compiled a list of things I would like to accomplish this year and things I am looking forward to! Mostly, I just like making lists! :) It has got to be one of my favorite pastimes. It's always fun to set goals for yourself and just do your best. While some things I have jotted down that I personally want to strive to work on and improve this year, some are just plain silly and fun! I have to remind myself that while I am making goals, to be sure and have fun in the process, slow down, and just take time to enjoy the trivial. Read, read, & read! I have not nearly taken the time to read as much as I should the past couple of years. I have an entire personal library at my disposal and most of them I have never read! This year I want to take the time to read some classics, spiritual, cookbooks, and lifestyle books. 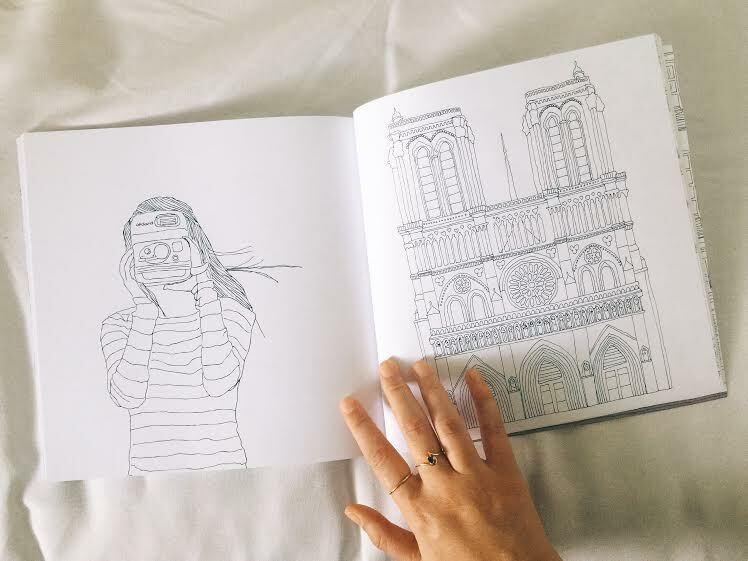 More specifically, Paris is on my mind a lot these days and there are several books on the subject that I would like to read before traveling abroad. On my list: Lunch in Paris, How to Be Parisian Wherever You Are, and Paris Underground to name a few. I would also like to cook a French dish just for fun. Live well. This consists of preparing/eating healthy meals at home and out and about. Also, I want to be more disciplined in consistent exercise. Journal. I have also really slacked in this area. Before I was married I journaled pretty consistently but for the past four years it has been either few and far between or non-existent. Even if it's just jotting down some thoughts on paper, a few lines that someone said or did, I want to take time to record the moments and not leave it to my mind to store every little happening. One of the other things I need more consistency in is reading and meditating on the Word. Just to be real and honest, there are many days I just don't feel like reading my bible or taking the time to meditate on it. I think "I forgot to put on that load of laundry" or "I am going to browse my Instagram for a few" and before I know it an hour has passed. I want to forsake my third kidney this year (my phone is literally always attached to my hip), learn to leave it in the next room (no, it really can wait) and spend more undistracted time alone with my Lord. I deeply desire for Him to be my ALL and to know Him even more intimately this coming year. Go on more dates. Because you can never go on too many or spend enough time with your best friend. I can't anyways. I'm so looking forward to growing in love with Josh even deeper this next year and taking on more adventures in 2016. He is my favorite. Write more letters. In a day and age of social media frenzy and texting galore, the art of the handwritten note is becoming an endangered species. I love to get snail mail and I want others to experience that joy as well. Invest more time in my first love. I want to get back into photography. It is what I studied in school and what I invested most of my time and money in back in the day. I had put it on the shelf for the past couple years but I want to dust it off and get invested once again. Here's to more projects and using it to capture images that myself and others can treasure forever. Take an interior decorating/design class. My other passion is interior design. I have not had any proper schooling or training on the subject but ever since I was a little girl I have had a passion for making things pretty and bringing a space together. I would love to embellish that passion and take it to another level. Fall in love with Audrey again. Ok, I have never fallen out of love with her but just recently I have wanted to read her books and re-watch her films all over again. I grew up on Audrey Hepburn films and she quickly became an obsession with me. I had to collect her movies and biographies, hang her posters on my wall, and even write a research paper on her for school my junior year.I remember one summer (before Netflix and when Blockbusters were still around) calling every movie store in the Atlanta area to find her rare films and binge-watching them with my mom and sister. I had the idea not long ago of trying to get my hands on whatever movies of hers that I don't have and watching them in the order they were shot. A few of her earliest ones that she had a very minor part are not available anywhere (sad day) but some of her rare movies that I still have not seen I have been lucky to find online. I think it will be a fun project to watch her films in order and see her acting and characters evolve. Do you have a favorite film of hers? I would love to hear. Plan our trip abroad! This will definitely be one of the most enjoyable projects this year! Already searching online for must-see sites in Paris, Amsterdam, and Brussels has been sooo much fun! Browsing Parisian flats, cafes, and canal cruises has left me day-dreaming every day of this adventure that awaits us! I can not wait to see and snap pictures of these places I've only ever seen in books and in my imagination.